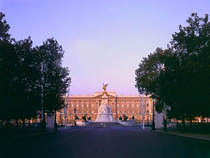 Buckingham Palace is one of London's most recognised landmarks and is home and office to the British Queen. It was originally built for the Duke of Buckingham in 1703 and was named Buckingham House, but was acquired by King George III in 1761. In 1824 work began for it to be converted into a Palace for George IV, however, he did not live to see it complete. The first monarch to live in Buckingham Palace was Queen Victoria in 1837. At present, the State Rooms are used by The Queen and members of The Royal Family to entertain visitors, including Heads of State. The Buckingham Palace State Rooms are open to the public during the summer months while The Queen takes her annual visit to Scotland.